Is it time to paint your exterior? Sometimes just looking at the paint on your exterior will not show any signs of the paint getting old. Get a little closer and run your finger tips along the wall and see what shows up. If there is a chalky residue on your finger tips it may be time to paint. If there is a light chalky residue pressure cleaning will remove most of it and a new paint finish can be delayed for now. If the chalk is medium to heavy it is time to paint, but not so fast there a few very important things to know and do prior to painting. First, what is chalk? Chalk is a natural process of paint as it erodes from the sun, wind and rain. The binder in the paint degrades over time and the paint pigment rises to the top leaving a chalky residue. Depending on the quality of the paint will determine how long the finish will last. Quality paint will last much longer especially if a primer was applied prior to painting. Next, chalk must be removed to ensure proper paint adhesion. If your up for the task and your in good physical shape its time to pressure clean the exterior with a 1500 to 2500 psi pressure washer using a 25 degree tip/ nozzle. Ware the proper eye protection and clothing during this process. Note: Homes built prior to 1978 may contain lead based paint. The dust or fumes created by cleaning, sanding or disturbing these surfaces can lead to adverse health effects in children and pregnant women. For more information please call National Lead Information Center at 1-800-424 LEAD. While pressure cleaning, keep your pressure gun moving at an even pace. Concentrating on an area for too long will scar the area or remove the paint. Start cleaning at the top and go side to side, steadily reaching the bottom of your exterior walls. If there's areas which are hard to reach there are extensions which can be attached to the end of the pressure gun. The mixture of chalk and water will produce a milky color and will become clearer as the washing continues.. It can’t hurt to go over the area a second time to ensure proper cleaning. Note: Before pressure cleaning close all windows and doors. Move items that are close to the home so they will not fly into you during cleaning. Do not get to close to the windows while cleaning. If there are metal or plastic soffits try to keep the pressure off these areas; they tend to bend or displace the sections and sometimes damage these areas. Getting to close to wooden areas will scar the wood. Window, doors and rooms which have screens be careful not to get to close to these areas, it will cut into the screens. Most important do not point pressure gun at any part of your body. Once the pressure cleaning is completed wait for the exterior to dry at least a full day. Wipe your fingers across the walls at several areas of the exterior and check if there is any chalk left. If there is chalk, is it light or heavy? If it’s heavy the exterior will need another washing. If the chalk is light a bonding primer should be applied to ensure proper adhesion of the paint. There are several products which work very well to give your exterior a sound surface to apply paint. Depending on what type of exterior surface you’ll be painting will determine the binding primer to use. Bonding additives such as Emulsa Bond can be used on wood and masonry. Oil base primers can be used on many types of substrates. Water base 100% acrylic emulsion conditioners are also very good for stucco or masonry substrates. Remember to ask for products that work well with mild to medium chalk. Follow the directions for the product which best suits your situation. Once completed, this vital procedure will create a proper surface for your paint and one which will keep your home exterior finish lasting for years. OK! You're master bathroom has been faux painted but something is missing. There are great architectural lines in the room and they need to show. A great way to bring these beautiful lines out is to add a marble faux border. 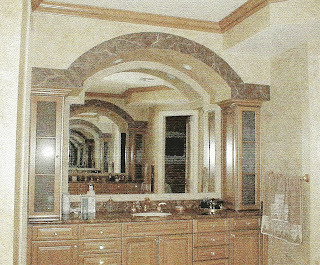 In this picture the marble matches the counter top and brings out the beautiful arch overhead. 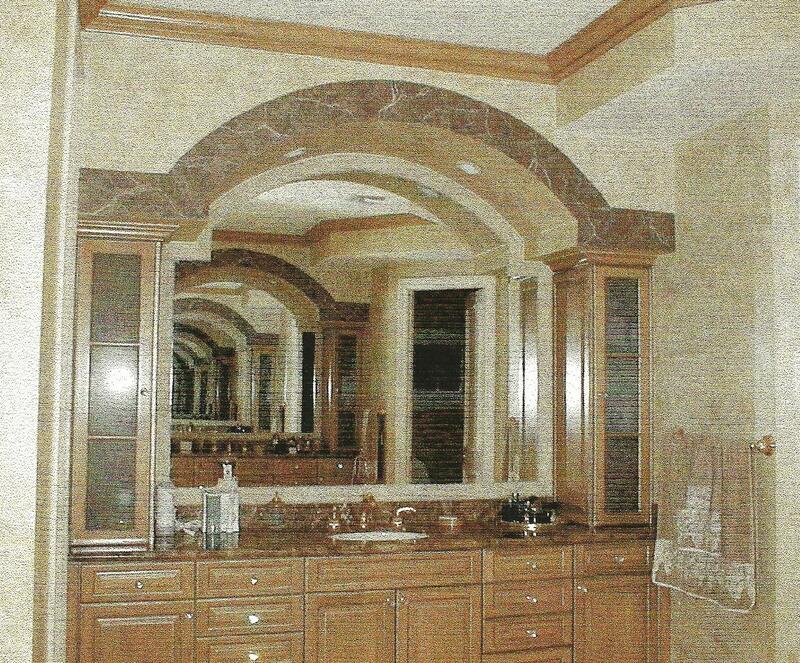 The glaze on the walls and the faux marble finish are from the same color. The rag technique was applied over a light beige eggshell finish with a diluted mixture of a deep chocolate latex paint in glaze. The marble boarder base coat was a full strength deep chocolate latex semi - gloss paint. To achieve a more realistic appearance use several lighter glazes over the base coat. Add veining with the lightest colors and run some darker veining randomly for depth. Apply water base urethane with a gloss finish to give that polished look and to bring out all the color. Boarders can be applied in many areas of a room. Traditionally they were applied along the ceiling or across the room about chair rail height. Design your own boarder and add interesting lines to create some magic. Boarders will make a room look longer, wider or higher depending on were there applied and will also add that special touch you're looking for.